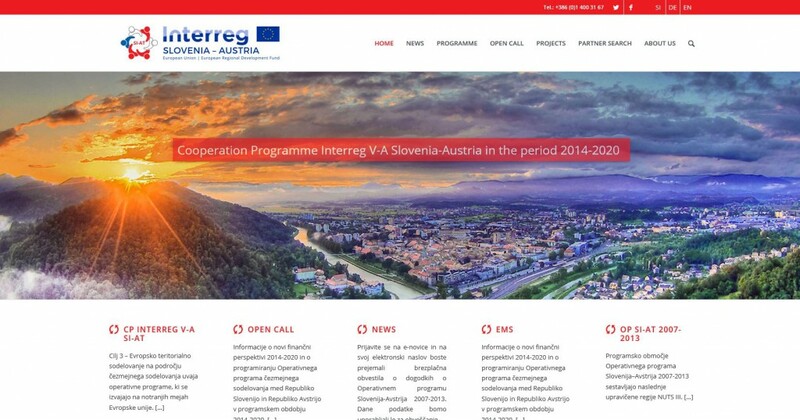 We would like to inform you that on 18 December 2015 the new website of the Cooperation Programme Interreg V-A Slovenia-Austria for the period 2014-2020 will be launched, which you will be able to access under the same address as until now (www.si-at.eu). Due to the transfer of the website into a new environment, in which you will also be able to access the current website of the Operational Programme Slovenia-Austria 2007-2013, the E-Newsletter subscription in the frame of the OP SI-AT 2007-2013 will be discontinued. In order to receive further E-Newsletters in the frame of the Cooperation Programme Interreg V-A Slovenia-Austria, you will be shortly able to register on the new website. At the same time, we would like to inform you that until the end of tomorrow, also the Open Call for Proposals in the frame of the Cooperation Programme Interreg V-A Slovenia-Austria for the period 2014-2020 will be published on the new website.